Artistic Adventures: LIFE. is not Short! Life is not short. It's actually quite long. 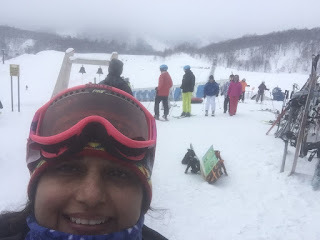 I just celebrated my 48th birthday on the ski slopes of Hanazono Mountain in Niseko, Japan. Why is this a big deal for me? 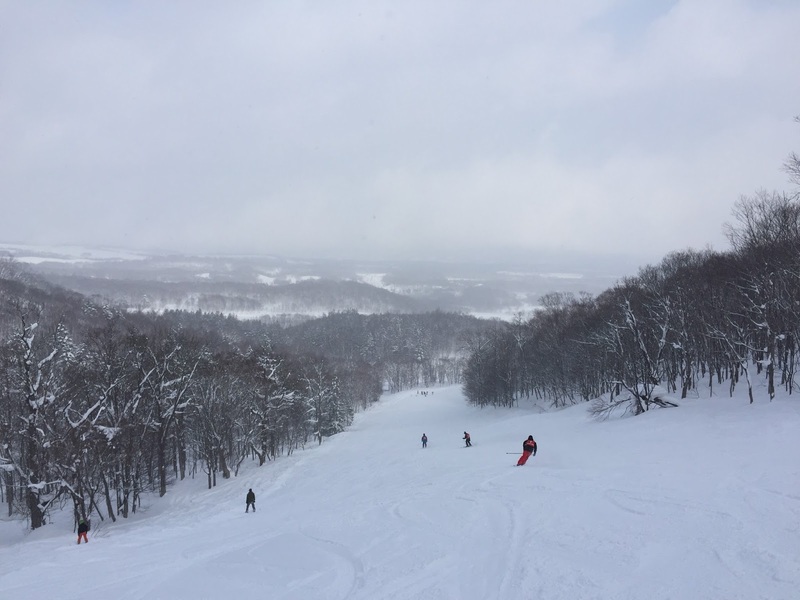 I hadn’t been skiing since a ski accident in Killington, Vermont left me with a torn ACL (Anterior Cruciate Ligament) in my left knee – which required surgical repair about 10 to 12 years ago. It was a bit intimidating to get back on the slopes after so many years! 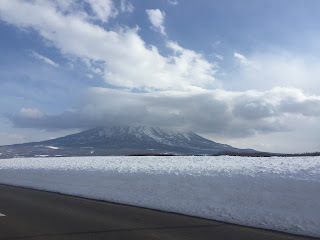 Thankfully, I had a great instructor at the Niseko International Ski School (Mark) who patiently “re-taught” me how to ski with improved form and great tips. A half-day lesson from an excellent teacher and my confidence was back! I skiied for 3 1/2 days with my husband and boys (boys snowboard, hubby skis) And now! I can’t wait to go skiing again and am determined to stay in shape so I can (hopefully) ski into my 70s! OK – maybe that's ambitious - but if I shoot for 70 - maybe I can make it to 65? I am ready! See the bells behind me on top of my head? 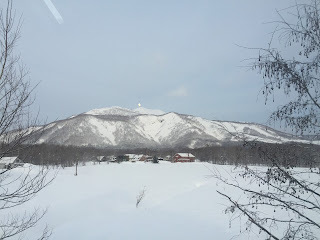 on the mountain. My hubby rang it for me to have good luck (and injury-free). On my last day of skiing as I finished my last run - I rang it to celebrate being BACK! 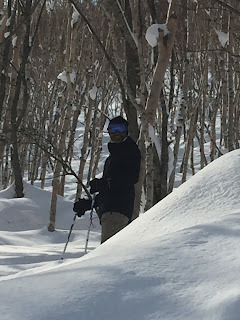 My husband tree-line skiing in the powder. day meant FRESH powder every morning! 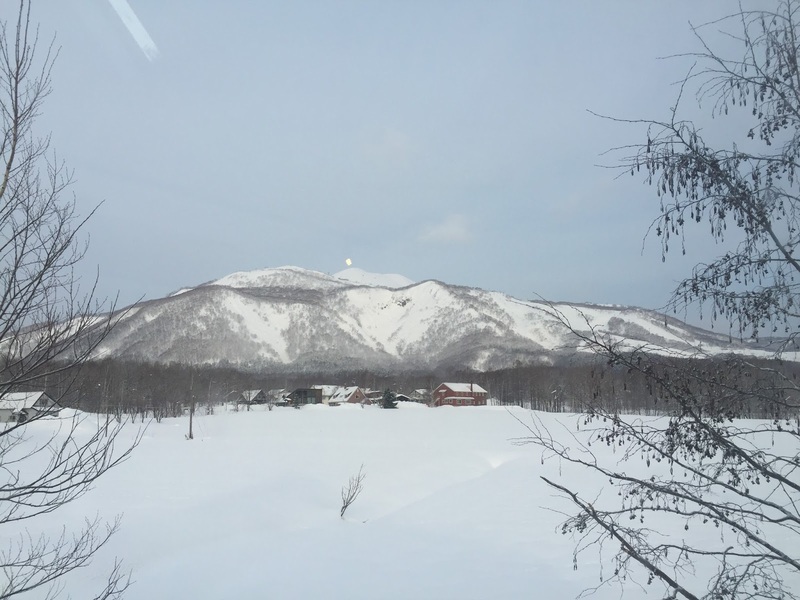 It was refreshing, meditative and having an “aha” moment of “I can ski for the next 15 to 20 years if I keep fit” turned into another “aha” moment of “OMG – Life is LONG!”…. This realization became artistically therapeutic on so many levels. I realized I have time… I spent 20 years in my first career and am grateful that I enjoyed it every day. I can do the same as I start my artistic career... whatever that ends up looking like. And – because life is long – I get to enjoy it and look forward to it for at least the couple decades! Where life does come up short, however; are the many experiences and adventures we have. The short time I have left with our parents, or the short time I may have in learning something, experiencing a new culture, embarking on a new adventure is something to cherish and something to look forward to. More importantly, I have to make the most of it and simultaneously - slow down to enjoy the moments so I can savor each one later. My Oil/Drawing Instructor is a wonderful woman in her late 60s, she is inspirational to me because she is fit, active, and doing what she loves – painting and teaching. I have been under her tutelage for the past 3 years and love it. Living in Tokyo has allowed me the opportunity to study under her. My time with learning the art of Sumi-E (Japanese brush painting) is even more urgent while I am here in Tokyo. I can’t depend that upon my return to the US I will find such excellent instruction from such talented Sumi-E artists. (see previous blog post The Art of the Japanese Brush). For now, thanks to an excellent ski instructor and my family for encouragement I can cross off an item on my bucket list! Getting back on the slopes to ski! (With) PEACE. (In) ART. (To the) SOUL. Always - I love hearing from you and your thoughts, ideas on future posts. Please feel free to leave me comments below! If you would like to commission a painting of your favorite vacation landscape spot, please contact me. With a photograph and a short discussion, I will give you a painting that captures the spirit of your experience. To view my Artworks and/or Inquire about Commissions!